When I was sick last week, my mum and sister kept telling em to stay hydrated. I know I don't drink nearly as much as I should, but I wasn't sure exactly how dehydrated I was. So I did a little internet research to find out just how much I should be drinking. There seem to be few differences of opinion, but my favorite is the easy to remember 8 x 8 rule, which is eight 8 oz glasses of water every day. 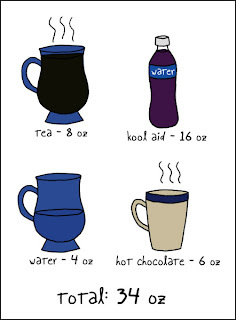 It is okay to substitute other beverages, but you should not make tea, coffee, and soda the majority of you liquid intake for the day. 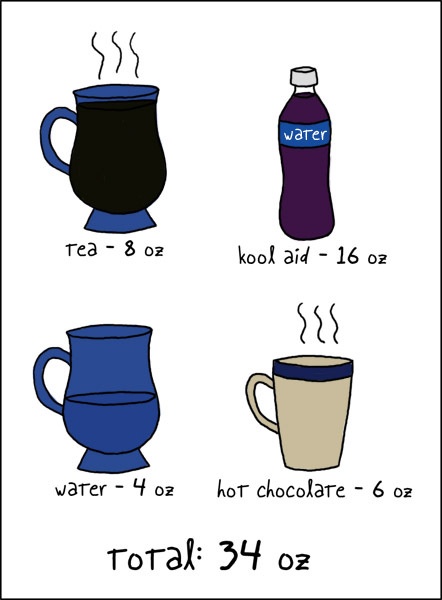 So basically, you should drink at least 64 oz of liquid every day. So there you go. I am at least 30 oz below the recommended daily serving of water. And almost a quarter of that was tea, which I should be avoiding. Oops. Guess I should probably work on that.